Mark Monday, October 23 on your Calendar to receive BIG SAVINGS! Click the Pic to See Our Video! I have to tell you I am no movie star. I am super comfortable with my clients one-on-one but a little more shy when in front of a camera. However, when I received the new CoolSculpting Petite attachment, I was so excited. I could imagine all the new opportunities I now had to help my clients reduce fat deposits in a wider range of areas, and knew I had to share the news with the world somehow. 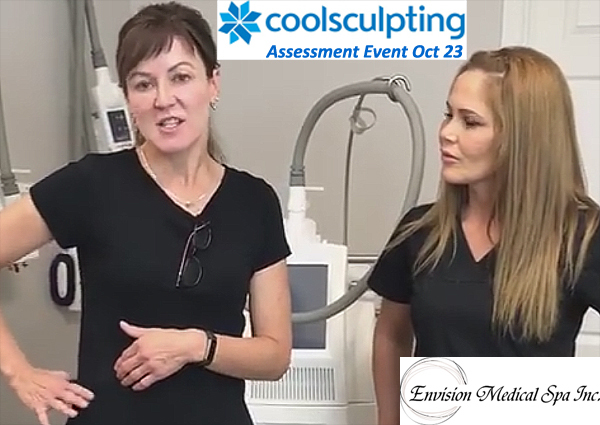 I talked it over with my wonderful Envision CoolSculpting team and together we decided to make our very own video to promote a special Assessment Event coming October 23, 2017. It took a lot of courage to make this mini-movie because instead of using strangers in it and then trying to get viewers to take unfamiliar people at face value, we decided to show you my own personal results. What makes this video different is that, not only am I the "test subject" in the vid, I also only did half my body. I did this to show the dramatic difference CoolSculpting makes in specific-region fat loss. It is way more effective than any other "before and after" video where you really wonder if it's even the same person. You'll see there is no doubting the difference CoolSculpting has made when I lift my shirt and show you my own personal results. Ready for the Other Half! On the downside, however, I now have a half of a "muffin top"! Luckily, though, this shows you the incredible job CoolSculpting did on my own body. I will be able to lose the other half of my muffin top in no time at all. And you know it's safe because we have no concerns about using the equipment on ourselves. Inner and yes, even OUTER thighs! Please watch the video and then give Envision Medical Spa's highly-trained health and wellness clinicians (and videographers!) a call to answer any questions you have about the safe, natural CoolSculpting fat reduction and body shaping system. We believe it's the answer to exercise and diet-resistant fat deposits you've been looking for and we have the proof right here. Please enjoy our video and let us know what you think!